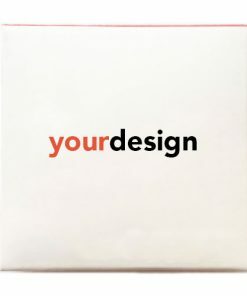 Design custom condoms using our easy tool. Just add your logo, photos, illustrations or text and order online instantly. Just want to upload a file? Try the simple product designer. View full pricing table below. Hit ‘customise’ to start designing. Just want to talk? We hear you. Call us on 01457 338000, or get in touch on our contact page. Discounts will be automatically applied when the appropriate quantity is added to your basket. Please note, bulk discounts are calculated per design. What does the condom wrapper look like? Your design will be printed onto a white background on the front of the condom wrapper. Other colour packets are available for orders of over 100 pieces – please enquire for more information. The back of the packet features required safety information and instructions. Do I get to see a proof of my design? For larger orders we can provide a photo proof of an actual print before dispatch for you to confirm you are happy with the design. 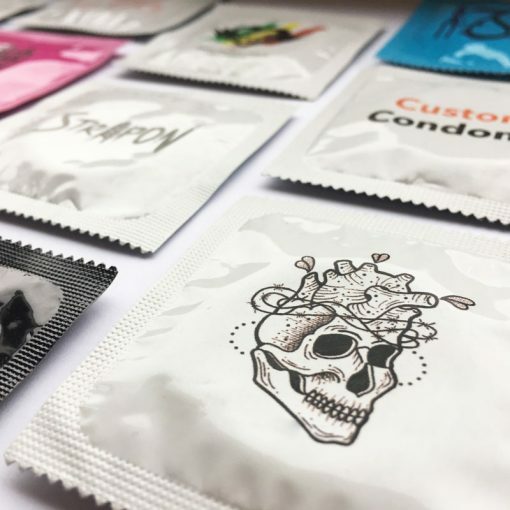 Are the condoms safe to use? What size are the condoms? The condoms are standard size. The maximum length is approximately 180mm and the width is approximately 53mm. 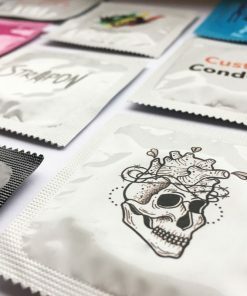 The condom wrappers measure approximately 60mm by 60mm, and the printable area is approximately 50 x 50mm. 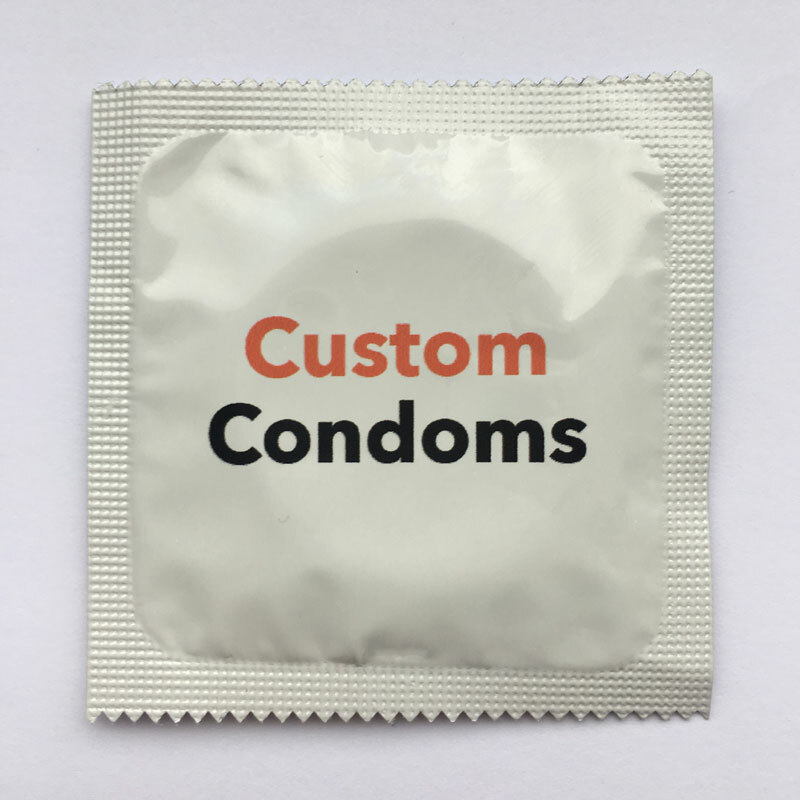 We offer free UK delivery, and we aim to process and deliver all custom condoms within 1-3 business days (Mon-Fri). Orders are sent in plain, discreet packaging. Express delivery is also available for £3.99. These orders will be jumped to the front of the queue and processed as quickly as possible. We offer worldwide delivery to all countries. For smaller orders, of 50 pieces or less, delivery costs £3.99. For large orders, above 50 pieces, the cost is £20. Orders are usually processed within 1 working day, and delivery takes approximately 4 to 7 days, but this varies depending on the country. For more information on our shipping, please don’t hesitate to get in touch. Due to the custom nature of this product, we cannot accept returns or refunds unless the product arrives damaged or defect. If the latter is the case, please don’t hesitate to get in touch and we will be happy to help resolve the issue. If you would like to see a proof of your design before delivery, please leave a note at checkout.